Over the course of three decades, visitors to Los Padres National Forest were often greeted by Joe Pasinato. He knew the forest like the back of his hand and offered advice on camping and hiking spots that enriched many visitors’ experiences. During fire emergencies, Joe answered calls at the U.S. Forest Service information center and worked with television, radio, and print reporters to keep the public apprised of the firefight. Following a 28-year career, Joe retired March 31, 2012. Friends and former coworkers were devastated by the news of Joe’s death February 16 in Santa Barbara. He was 63. Joseph Francis Pasinato Jr. was born and raised on Santa Barbara’s Eastside, the only child of Joseph and Beatrice Pasinato. His father, Joe Sr., was a longtime city employee who worked on the Tecolote pipeline. When Joe Jr. was 5 years old, he was given the honor of pushing the button that fired off the last explosion that opened the pipeline; everyone called him “Tecolote Joe” after that. Joe attended Santa Barbara junior and senior high schools and went on to study computer programming at Santa Barbara City College. Following school, Joe worked as a grocery clerk, an auto mechanic, a ranch hand, and a horse wrangler before going to work for Los Padres National Forest as a radio dispatcher in 1984. When this temporary job ended, Joe transitioned into a permanent position in the Forest Supervisor’s Office. Joe became an integral part of the daily operations: working as the front-desk receptionist, assisting with the dissemination of fire information to the public and news media, and managing the mailroom. As part of Joe’s early job description, he even had responsibility for performing routine maintenance on government vehicles such as oil changes and ensuring the fleet was in working order. Joe’s sense of humor was indeed dry. 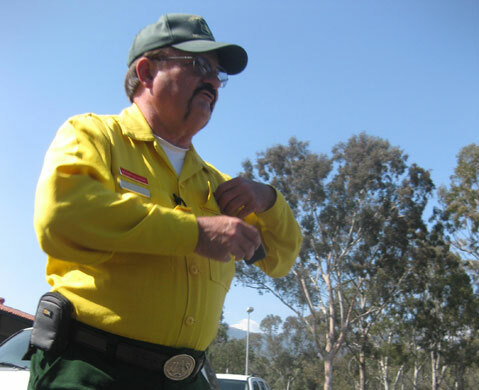 During the Jesusita Fire, Joe worked Los Padres’ call center. A woman from back east phoned late one evening to express concern about the name of the fire. Unaware that the trail had named the fire, the woman worried that “Jesusita” was sacrilegious. When Joe told me about the call, I asked how he had handled it. “I sent her over to the county’s call center,” he said. This was a typical Joe story. In reality, after two decades of dealing with the public, he had developed a knack for defusing tensions and helping people get the answers they were seeking. Joe took great pride in his work. Coworkers fondly remember the dedication and commitment he demonstrated in every one of his assignments. He gladly set aside whatever he was doing to assist a fellow employee or friend in need. His reputation throughout the Santa Barbara community earned the respect of cooperating agencies that relied on Joe whenever questions or issues arose. Toward the end of his career, Joe had the chance to utilize his college computer programming knowledge when he assumed the duties of Los Padres Forest web manager. Joe embraced this new challenge with his customary enthusiasm and worked to improve the content of the forest webpages. An overflowing crowd packed a Buellton restaurant in April 2012 for Joe’s retirement celebration. While the Forest Service presented Joe with the traditional farewell gifts, his coworkers and friends bestowed so many plaques, hats, and other tokens of appreciation on him that his truck couldn’t hold them all. It was truly a special moment honoring Joe’s remarkable career. A public memorial barbecue service for Joe Pasinato is scheduled for Saturday, May 3, 11 a.m.-4 p.m. at Stow Grove Park on La Patera Lane in Goleta. Anyone who knew or worked with Joe is welcome to attend. A main course of barbecued chicken will be served along with drinks, and guests are encouraged to bring a side dish to share.